Good morning WOYWWers. Today I have two different desks to show you. This first one is my sewing room/study and on there you can see some cream and gold brocade. My daughter Judith is being ordained in June and she needs a stole. (One of those strange things Anglican priest wear, along with all their other fancy vestments.As a Baptist minister her father didn't bother with all that paraphenalia) She spent a long time trying to work out what she wantedincluding looking at some beautifully embroidered ones, but they were very expensive, then I canvassed a couple of WOYWWers who do beautiful embroidery and one very kind lady said she would make one and what did my daughter want. Well at that point Jude was taking exams and buying and selling a house and simply couldn't get her head around thinking what to ask Jo to do for her. So she bought a nice painted Fair Trade one. 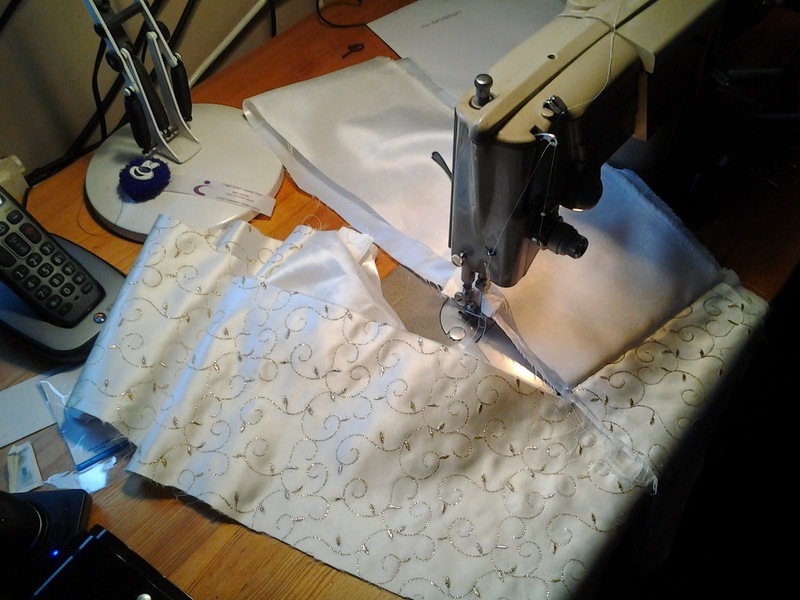 Then she had a brainwave, her wedding dress was sitting in her attic and it would be rather fitting if I could use the brocade from that to make a stole for her to wear when she conducted weddings,so that is what is on my sewing machine. 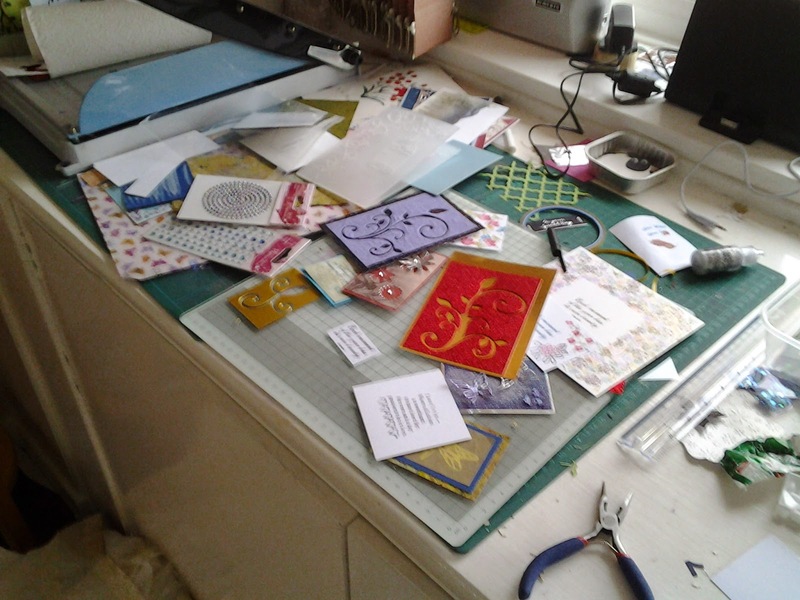 My landing worktop has some card makings and a few ATC's, partially hidden, so no one can see a complete one yet. I have completed a dozen and have at least another 6 which will be finished, so if you wish to swap with me, please let me know. So you can see stamping, die cutting, gems, a nice freebie embossing folder and all sorts of clutter on there. If you have just arrived at this page and wonder what I am burbling about, please visit Madame Julia , the desk queen of WOYWW where all will be explained and you can snoop on over a hundred really exciting desks, if you have the time. Ah Chris, the stole from a wedding dress is just perfect, how lovely an idea. And how marvellous of Jo to offer, she's so giving.You're very busy gal! I'll just say what everyone else has said, the idea of the wedding dress being used to make the stole for weddings is beautiful. Even if no one at a particular wedding knows, the symbolism will be there. Just fabulous really. That is going to be a beautiful stole, Chris, and what a great idea to use her wedding dress material, and how appropriate to wear it for weddings! I hope her ordination goes well and that she will be very happy in her ministry. Thanks for your visit and your nice comment - so glad you like my mirror! I painted several at the same time, including several with poppies on them. I got the idea from Sheena Douglass' method but I don't use a stamp for the design as I prefer to paint my own from scratch. The teabag art has taken a bit of a back seat for the moment while I finish the album I'm working on, not that you would think so as my whole ARTHaven seems taken up with drying teabags!! What a wonderful idea to make her stole from her wedding dress fabric. I hope we get to see a photograph of her in her vestments. the stole is going to be stunning what beautiful fabric and a truly wonderful idea it will be so special and perfect for conducting weddings...I hope it the ordination is a great day for everyone. your ATCS look Fab ...Ii have already swapped my extras ;-(....I only made 5 in total ...big improvemnet on last years 1 !....maybe next year or if i make some more i will get in touch. Sorry I am getting around so late this week, gosh you are brave cutting up the wedding dress but that is not going to be worn again is it. As for the stole wow it is looking brilliant for her vestment, it holds such love and meaning just in the material and the sacrifice of the dress, so fitting, well that is my thinking. Can wait to see it finished now. Onto the card it was $10 worth not $19 as for Yoda he is a demanding cuddly boy and cries and howls if you don't cuddle him, he can't survive without them. He is such a bliss to have in our lives. Thanks for dropping by and saying hello too.